Romanesque Revival is also sometimes referred to as the "Norman style" or "Lombard style", particularly in works published during the nineteenth century after variations of historic Romanesque that were developed by the Normans and Lombards, respectively. Like its influencing Romanesque style, the Romanesque Revival style was widely used for churches, and occasionally for synagogues such as the Congregation Emanu-El of New York on Fifth Avenue built in 1929. The style was quite popular for university campuses in the late nineteenth and early twentieth century, especially in the United States and Canada; well known examples can be found at the University of California, Los Angeles, University of Southern California, Tulane University, University of Denver, and the University of Toronto. The development of the Norman revival style took place over a long time in the British Isles starting with Inigo Jones‘s refenestration of the White Tower of the Tower of London in 1637–38 and work at Windsor Castle by Hugh May for Charles II, but this was little more than restoration work. In the 18th century the use of round arched windows was thought of as being Saxon rather than Norman and examples of buildings with round arched windows include Shirburn Castle in Oxfordshire, Wentworth in Yorkshire and Enmore Castle in Somerset. In Scotland the style started to emerge with the Duke of Argyl’s castle at Inverary, started in 1744, and castles by Robert Adam at Culzean (1771), Oxenfoord (1780–82), Dalquharran, (1782–85) and Seton Palace, 1792. In England James Wyatt used round arched windows at Sandleford Priory, Berkshire, in 1780–89 and the Duke of Norfolk started to rebuild Arundel Castle, while Eastnor Castle in Herefordshire was built by Robert Smirke between 1812 and 1820. It was at this point that the Norman Revival became a recognisable architectural style. In 1817 Thomas Rickman published his An Attempt to Discriminate the Styles of English Architecture from the Conquest To the Reformation. It was now realised that ‘round-arch architecture’ was largely Romanesque in the British Isles and came to be described as Norman rather than Saxon. The start of an archaeologically correct Norman Revival can be recognised in the architecture of Thomas Hopper. His first attempt at this style was at Gosford Castle in Armagh in Ireland, but far more successful was his Penrhyn Castle near Bangor in North Wales. This was built for the Pennant family, between 1820 and 1837. The style did not catch on for domestic buildings, though many country houses and mock castles were built in the Castle Gothic or Castellated style during the Victorian period, which was a mixed Gothic style. The Romanesque adopted by Penson contrasts with the Italianate Romanesque of other architects such as Thomas Henry Wyatt, who designed Saint Mary and Saint Nicholas Church, in this style at Wilton, which was built between 1841 and 1844 for the Dowager Countess of Pembroke and her son, Lord Herbert of Lea. During the 19th century the architecture selected for Anglican churches depended on the churchmanship of particular congregations. Whereas high churches and Anglo-Catholic, which were influenced by the Oxford Movement, were built in Gothic Revival architecture, low churches and broad churches of the period were often built in the Romanesque Revival style. Some of the later examples of this Romanesque architecture is seen in Non-conformist or Dissenting churches and chapels. A good example of this is by the Lincoln architects Drury and Mortimer, who designed the Mint Lane Baptist Chapel in Lincoln in a debased Italianate Romanesque revival style in 1870. After about 1870 this style of Church architecture in Britain disappears, but in the early 20th century, the style is succeeded by Byzantine Revival architecture. The Ottawa Lemieux Island Water Treatment Plant, completed in 1932, is another example of Romanesque Revival architecture, with a prominent main corridor featuring rows of arches spaced along the length of the building, providing a sense of grandeur. The Church of the Pilgrims—now the Maronite Cathedral of Our Lady of Lebanon—in Brooklyn Heights, Brooklyn, New York designed by Richard Upjohn and built 1844–46 is generally considered the first work of Romanesque Revival architecture in the United States. 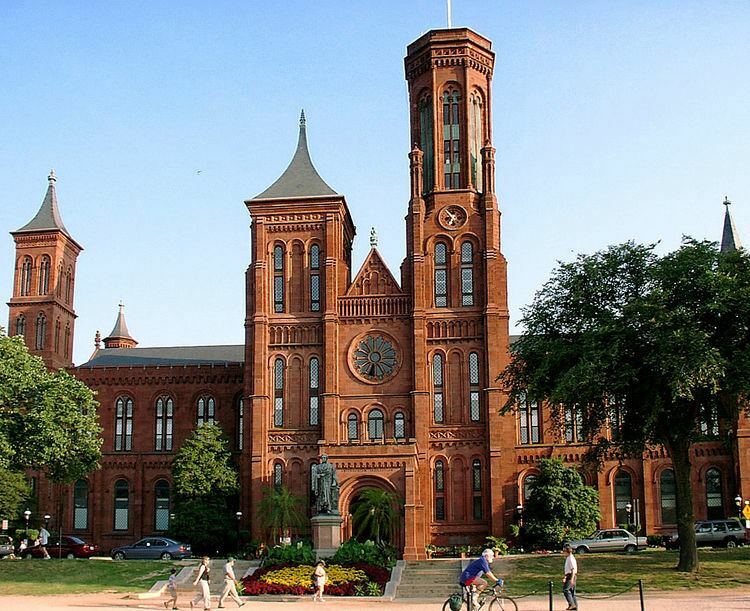 It was soon followed by a more prominent design for the Smithsonian Institution Building in Washington, D.C. designed by James Renwick, Jr. and built 1847–51. Renwick allegedly submitted two proposals to the design competition, one Gothic and the other Romanesque in the style. The Smithsonian chose the latter, which was based on designs from German architecture books. Several concurrent forces contributed to the popularizing of the Romanesque Revival in the United States. The first was an influx of German Immigrants in the 1840s, who brought the style of the Rundbogenstil with them. Second, a series of works on the style were published concurrently with the earliest built examples. The first of these, Hints on Public Architecture, written by social reformer Robert Dale Owen in 1847–48, was prepared for the Building Committee of the Smithsonian Institution and prominently featured illustrations of Renwick's Smithsonian Institution Building. Owen argued that Greek Revival architecture—then the prevailing style in the United States for everything from churches to banks to private residences—was unsuitable as a national American style. He maintained that the Greek temples upon which the style was based had neither the windows, chimneys, nor stairs required by modern buildings, and that the low pitched temple roofs and tall colonnades were ill-adapted to cold northern climates. To Owen, most Greek Revival buildings thus lacked architectural truth, because they attempted to hide nineteenth century necessities behind classical temple facades. In its place, he offered that the Romanesque style was ideal for a more flexible and economic American architecture. Soon after, the Congregational church published A Book of Plans for Churches and Parsonages in 1853, containing eighteen designs by ten architects, including Upjohn, Renwick, Henry Austin, and Gervase Wheeler, most in the Romanesque Revival style. Richard Salter Storrs, and other clergy on the book's committee were members or frequent preachers of Upjohn's Church of the Pilgrims.